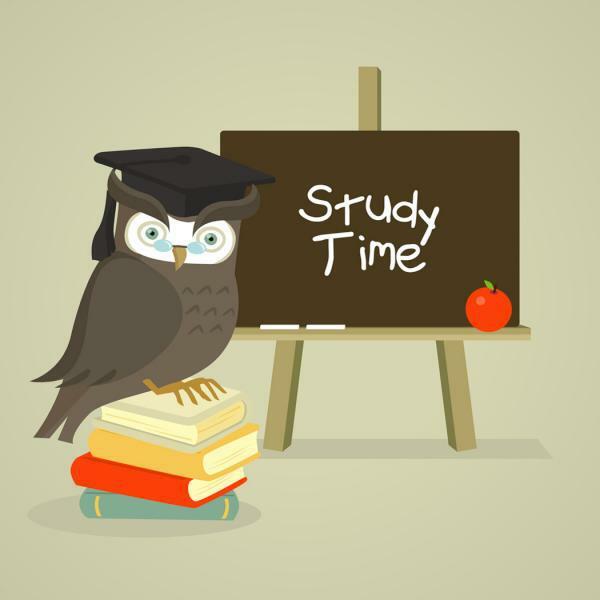 Study time is an intrinsic part of every successful student’s schedule. Students participating in the After School Supervised Study in Tarbert Comprehensive School will have the opportunity to study in a completely distraction free environment in an atmosphere that is calm and focused on learning. Study will be strictly supervised by experienced teachers who ensure that nothing but meaningful study takes place at all times. Many of our supervisors have supervised at State Examinations and will not tolerate any form of misbehaviour. Students know the importance of developing good revision techniques. The earlier in the year that they develop these skills and implement them into their study routines the more effective the outcome will be. After school study will begin on Monday September 18th 2017 and will take place every Monday Tuesday and Thursday from 4.10pm to 6.10 pm. 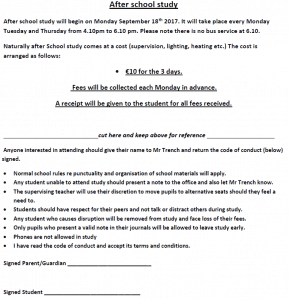 Due to the large numbers wishing to avail of After School Supervised Study in the past it has become necessary for parents to complete the below application form to ensure your child’s place and prevent overcrowding. Please note there is no bus service at 6.10. €10 for the 3 days. Fees will be collected each Monday in advance. A receipt will be given to the student for all fees received.